I’m a planner by nature. I don’t tend to actually follow through with the plans but I like to make them. I didn’t write a “birth plan” I just wanted to listen to my body, but you could say I had some ideas for postpartum. I imagined myself at home. To give birth to my beautiful boy in the water. To curl up into bed afterwards and nap. To bathe in my own bath with a lovely herb bath that my midwife makes. A yummy plate of fruit and delicious cheeses that I picked out at the grocery store waited for me in the fridge. A box of cake mix sat in the pantry and a big “0” candle so the boys had something fun to make to celebrate our new baby’s birthday. Okay, so I had a bit of a plan. Our youngest was born after a clunky, 20 hour stop-and-go labor that made me feel like some kinda newbie (what, does experience count for nothing anymore?). I went from 10 centimeters and pushing, back to 6 and got to do it all over again. (Yes, that’s possible!) He was born not with quiet concentration of his older brothers, but with the sounds of someone trying to muster whatever possible strength and energy left. He was not born in the water like Hudson, but on a birthing stool beside the nice warm tub. After being held and nursed for a few minutes, it was apparent that the adventure of birth was not over yet. After a bit of an ordeal, I found myself in the maternity ward of wonderful nearby hospital, having to stay the night for observation due to a partially retained placenta. I was not in my bed enjoying my new sheets. I was not in my herb bath which smells like cloves. I wasn’t eating yummy brie with apples, or blowing out the candle on a birthday cake. There were no mimosas. My older boys were not with me. I was not wearing my cozy pjs. I was in the hospital, with a bag of fluid that I had to wheel with me whenever I needed to go to the bathroom. My baby was not a patient, but a guest. I had no hospital bag packed so I had nothing with me. This was not the plan. It was so, so not the plan. But there I was anyway. I was later told that I earned a bit of a reputation on the maternity floor for being particularly friendly and chipper. I didn’t realize at the time that I had a choice. I didn’t realize could have been angry and disappointed because the beautiful experience I had hoped for was replaced by a rather dramatic (possibly traumatic?) experience instead. Bitterness had never occurred to me. When I think about the boys’ birth stories, this isn’t the first one I’ll be sharing. It can be described as a whole lot of things but I can’t truthfully call it pleasant… and it definitely wasn’t pretty, let alone beautiful. This story is a little bit more of a battle story. There were elements of beauty hidden in there, there was humor and there most certainly was love, but overall its a story of strength, giving our newest the nickname “Warrior Baby”. I would have loved my bath, and my cheese, and my soft sheets but I have this instead. I did allow myself a tear or two in mourning of the experience I had planned and lost, before going downstairs and celebrating Warrior Baby’s one week birthday. We made the cake that had been sitting in the pantry, and had a glass of champagne (the juice for the mimosas, which had been opened, had gone bad) and I reflected on how truly lucky I was. I could be traumatized by an occasionally gruesome, definitely painful and difficult delivery and postpartum. But in the end, everything went right when something went wrong. I have a story about actual, physical angels who I saw (and who apparently don’t speak English) and who literally picked me up and carried me. I can be thankful that mine is a story of adventure, danger, strength, courage, wisdom, love and a happy ending… all of the elements of a really great story. And I can have ownership of that. No, it wasn’t even close to what I had planned, but I learned so much more from it. Marlowe’s first picture, taken in the hospital waiting room. 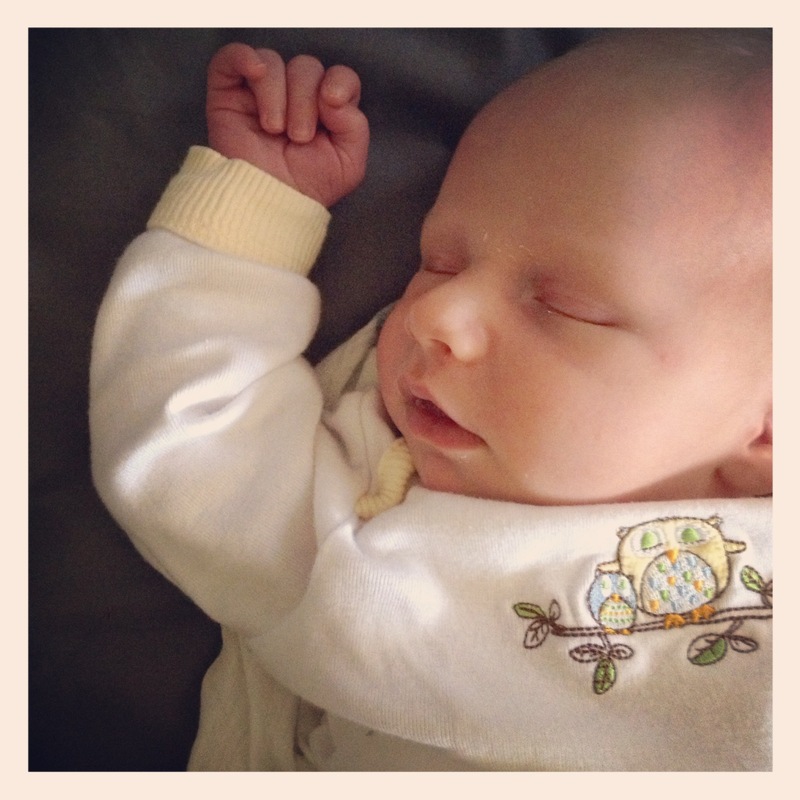 So, I am a little late in introducing my son to the blog. Here he is. Due February 18th but born on March 2nd after 20 hours of labor and 6 minutes of pushing. Born after the sun had risen and filled our bedroom with light. Who was quickly weighed at 9lbs, 2oz and measured at 22 inches before swiftly being put into a car seat to follow mom to the hospital only a couple hours old. Who comforted his father in the waiting room at the hospital. Who has a “going to the hospital” outfit instead of a “coming home” outfit. Who didn’t quite birth with me, but instead against me. My warrior baby, Marlowe James. It’s a wonderful story. And you are a great storyteller! Good golly, I had no idea you went through all of that. My congrats + condolences. Sounds half-way like how Spencer’s birth went (started in birthing tub, ended a day later in the hospital). Way to go the distance! Warrior baby, warrior mommy. I love his FIGHT THE POWER salute in the last photo. NEWBORN POWER! I’ve been reading your articles on Richmond mom, only to realize in talking to my husband that he knew you from Hip to Be Round (when I read your bio it sounded very familiar, like a customer he had told me about). He has the window cleaning account there. Anyway, I enjoyed your birth story. I’m a homebirther too, and a birth photographer. I’ve worked with many mama’s whose births haven’t gone as planned. I almost ended up at the hospital after my third with a retained placenta (an hour and 20 minutes later it finally came out at home). It can be very hard to emotionally process things when they don’t go as you hoped, but it sounds like you have a great attitude. Congrats on your little one! I’ve met your husband! He’s lovely and I’ve heard a lot about you and your kiddos! Thanks for reading both Rmom and the neglected motherblog. Hope your family is doing well!! Did you deliver with nancy or glenda? 4 boys, that sounds like so much fun! Our oldest two are girls and our youngest two are boys. I love having 4!!! Glad you are well and thanks for your great columns!